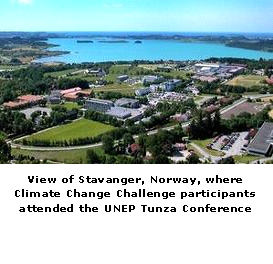 Young people in eight schools completed the Climate Change Challenge project during a school year, which also included a trip to the Tunza Children�s Conference on the Environment in Stavanger, Norway, in June 2008. � Common issues were found in all schools irrespective of the affluence of the area. � Opportunities for young people being cared for by the local council, to enhance involvement in the school community. The results include young people saying they were surprised to find that they could actually contribute. 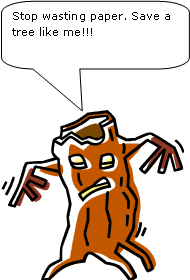 � Surveys and research undertaken by children and young people that involve groups who do not normally feel involved, with many participants reporting surprise at the energy and resource waste in schools. � Research undertaken by young people in association with �professionals� indicated that current monitoring might not give a true picture of what people actually know of environmental issues. � Children participated in same way as adults and were surprised to discover that teachers and even planners encounter the same problems. 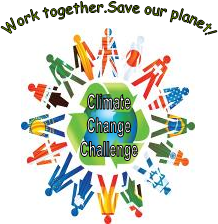 � Young people and adults involved in the project carried out practical actions and changes in their behaviour to be more environmentally-conscious. 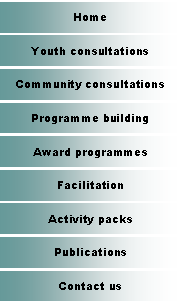 � A context for teachers to develop citizenship, eco committees, school council work,� science and geography work that encouraged children to investigate and develop practical action plans to reduce energy use in schools and develop potential policy priorities for decision-making bodies. � The development of initiatives and its delivery gave teachers and others the opportunity to use existing materials in a new framework. 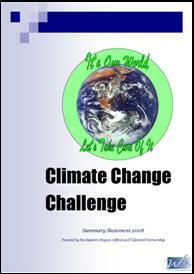 � There was also clear motivation for schools to develop and run energy saving schemes. � The project created a citizenship programme working with school councils and teachers to identify the barriers to energy conservation and their solutions.